you'll have a terrible hangover the next morning! 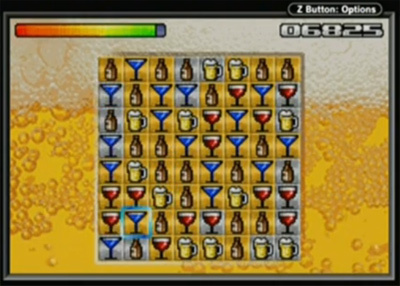 a direction on the joypad to swap it with the adjacent beverage. from grey to golden. New beverages will fall on the playfield. are golden, and end if you run out of time. Removing 3 items with a single move ................... 100 Pts. Removing 4 items with a single move ................... 250 Pts. Removing 5 or more items with a single move ........... 500 Pts. A time bonus is awarded after a level is finished. (c) 2013 by Nuance, Genesis Project and Digital Demolition Krew.